FIRST (For Inspiration and Recognition of Science and Technology), sponsored by Rockwell Automation , recently held the Hawaii Regional FIRST Robotics Competition in Honolulu. One of the key global partners for the FIRST program, Rockwell Automation was the recipient of the Founder’s Award at the World Championships last year in St Louis, USA for their continued sponsorship. 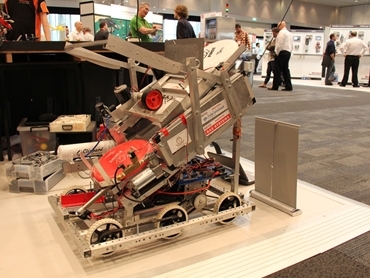 The Hawaii Regional FIRST Robotics Competition saw a strong contingent of Australian teams showcasing their science and technology skills. Of the almost 40 teams from five countries participating in this year’s Hawaii Regional, five teams were from Australia – Thunder Down Under (NSW), Rowville Secondary College (Victoria), Drop Bears (NSW), Roos (SA) and AI Robotics (Victoria). Thunder Down Under was particularly successful in Hawaii, finishing as the recipient of the Entrepreneurship Award, Woodie Flowers Award, a Dean’s List Finalist and runner-up for the Safety Award. In the highly contested Aerial Assist robot game, Thunder Down Under finished in the top eight and qualified as an alliance leader for the elimination rounds. Rowville Secondary College also made the Australian contingent proud by winning the Rookie Inspiration Award. The Australian chapter of FIRST is co-ordinated by Professor Michael Heimlich of Macquarie University’s Faculty of Science. According to Professor Heimlich, Rockwell Automation continues to make a significant contribution by providing endorsement to the FIRST program. He explained that the biggest impact is made on the participants themselves, who are undertaking real engineering, going to university, and developing an understanding of the importance of science and technology. Professor Heimlich adds that the official Australian Regional FIRST competition has been approved for 2015 and is tentatively scheduled for 20-22 March in Sydney. Teams from all over Asia Pacific, as well as the United States, are planning to participate in this event.